Here's the myth: Native Americans are people of great spiritual depth, in touch with the rhythms of the earth, rhythms that they celebrate through drumming and dancing. They love the great outdoors and are completely in tune with the natural world. They can predict the weather by glancing at the sky, or hearing a crow cry, or somehow. Who knows exactly how? The point of the myth is that Indians are, well, special. Different from white people, but in a good way. The four young male Native American poets whose work is brought together in this startling collection would probably raise high their middle fingers in salute to this myth. These guys and "guys" they are—don't buy into the myth. Their poems aren't about hunting and fishing or bonding with animal spirits. Their poems are about urban decay and homelessness, about loneliness and despair, about Payday Loans and 40-ounce beers, about getting enough to eat and too much to drink. And there is nothing romantic about their poetry, either. It is written in the vernacular of mean streets: often raw and coarse and vulgar, just like the lives it describes. Sure, they write about life on the reservation. However, for the Indians in their poems, life on the reservation is a lot like life in the city, but without the traffic. These poets are sick to death of the myth. You can feel it in their poems. These poets are bound by a common attitude as well as a common heritage. 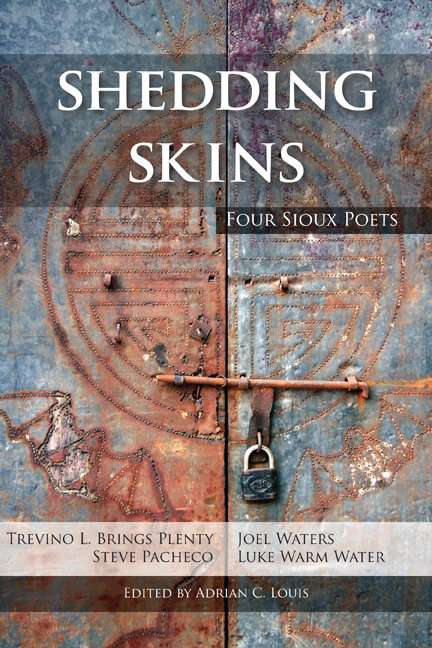 All four—Joel Waters, Steve Pacheco, Luke Warm Water, and Trevino L. Brings Plenty—are Sioux, and all four identify themselves as "Skins" (as in "Redskins"). In their poems, they grapple with their heritage, wrestling with what it means to be a Sioux and a Skin today. It's a fight to the finish. Adrian C. Louis was born and raised in Nevada and is an enrolled member of the Lovelock Paiute Tribe. From 1984 until 1997, he taught at Oglala Lakota College on the Pine Ridge Reservation. Since 1999 he has been a professor in the Southwest Minnesota State University system. He has written ten books of poems and two works of fiction. His recent collection, Logorrhea, was a finalist for the 2006 Los Angeles Times Book Prize. Trevino L. Brings Plenty is a poet and musician who works and writes in Portland, Oregon. He is a singer/songwriter/guitarist for the musical ensemble The Vinos. He is a Lakota Indian, born on the Cheyenne River Sioux Reservation in South Dakota. He has authored several books, including Drinking with the Rocks, Making Out with Shotguns, and Poems Madly Made in Three Days. Joel Waters, an Oglala Sioux, was born on the Rosebud Reservation and was raised there and on the Pine Ridge reservation. He is currently attending the University of South Dakota as an English major. His poetry can be found in the anthologies Genocide of the Mind: New Native American Writing and Eating Fire, Tasting Blood: Breaking the Great Silence of the American Indian Holocaust. Steve Pacheco is Mdewakanton Dakota from the Lower Sioux Indian Community near Morton, Minnesota. He works as an academic and guidance counselor/advocate for high school students from his community. Luke Warm Water was born and raised in Rapid City, South Dakota, and is an Oglala Lakota (Sioux). He was the first spoken-word poet to receive an Archibald Bush Foundation individual artist fellowship in literature. He has won various Poetry Slam competitions from Oregon to Germany. His recent books of poetry include Iktomi's Uprising and On Indian Time.